THE HANDPIECE IS A SPEAKER AND A MICROPHONE AS WELL. 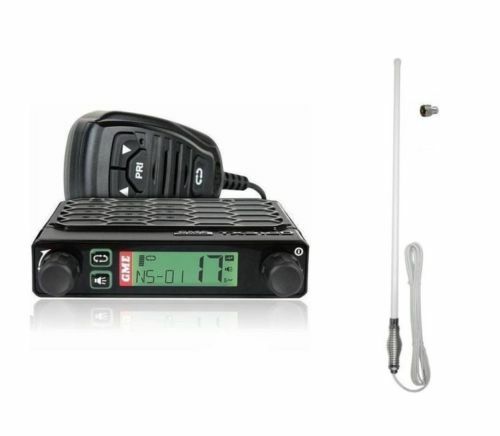 Synonymous with quality and reliability, the GME TX3120S is designed and manufactured in Australia and is the most advanced UHF CB radio of its kind. This 5 watt robust radio is engineered to maximise features in limited space. The impressive feature list also includes Digital Signal Processing, Advanced Signal Management and Dynamic Volume control – GME innovations to ensure more consistent, reliable communications. The radio includes CTCSS, DCS and Voice Inversion Scrambler for greater privacy and less interruption. 80 channels - 77 including telemetry (receive only) - 3 reserved for future use. DC lead 12V postivie and negative to battery. Packaged with 5.3M coax cable+ Connector (PL259). There is a fme connector on the end of the cable so you can just thread the cable through and then screw on the uhf pl259 connector to the end of it which is included for an easier fit. No soldering or cutting required. Excellent antenna for easy installation anywhere on the vehicle.